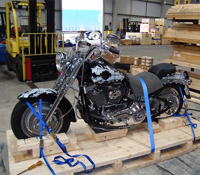 Shipping a motorcycle to or from Hawaii is easy and affordable with Premier Motorcycle Transport. Servicing Honolulu, Hilo, Kahului, Nawiliwili and all states on the mainland. We provide the most convenient transport options when shipping a motorcycle to or from Hawaii. Get an instant motorcycle shipping quote from the calculator to the left and find out why Premier is your best choice when you need a reliable Hawaiian motorcycle shipping company. With multiple sailings between Hawaii and the mainland every week, we offer the most convenient options when shipping a motorcycle to or from Hawaii. Servicing Honolulu, Hilo, Kahului, Maui, Kona and Nawiliwili with weekly availability to accomodate any schedule.